One of the criteria to be eligible to receive a Life & Justice Campaign grant is that an organization must be located within the geographic boundaries of the Diocese of Kansas City - St. Joseph. 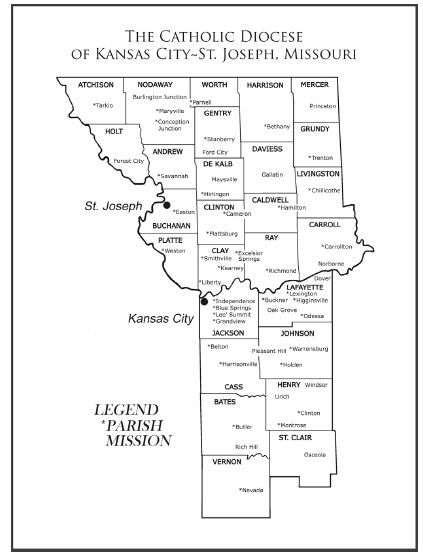 With 98 parishes and missions, the Diocese of Kansas City - St. Joseph covers 15,429 square miles in northern and western Missouri. Counties of the Diocese include Andrew, Atchison, Bates, Buchanan, Caldwell, Carroll, Cass, Clay, Clinton, Daviess, DeKalb, Gentry, Grundy, Harrison, Henry, Holt, Jackson, Johnson, Lafayette, Livingston, Mercer, Nodaway, Platte, Ray, Saint Clair, Vernon and Worth.